Come to this page to find everything you need to be up to date on the latest YCTIWY info! Show Closes to Resounding Applause! How to make a Really Big Sign!! 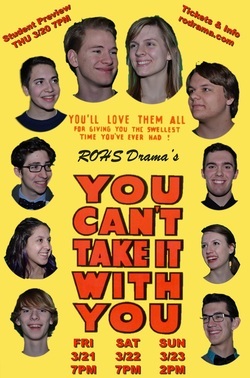 Have you seen the really big sign for You Can't Take It With You near the south entrance to Royal Oak High School? It's actually a bunch of little pictures. The Publicity Crew decided to take the Audition Pictures and make a collage to promote the show. 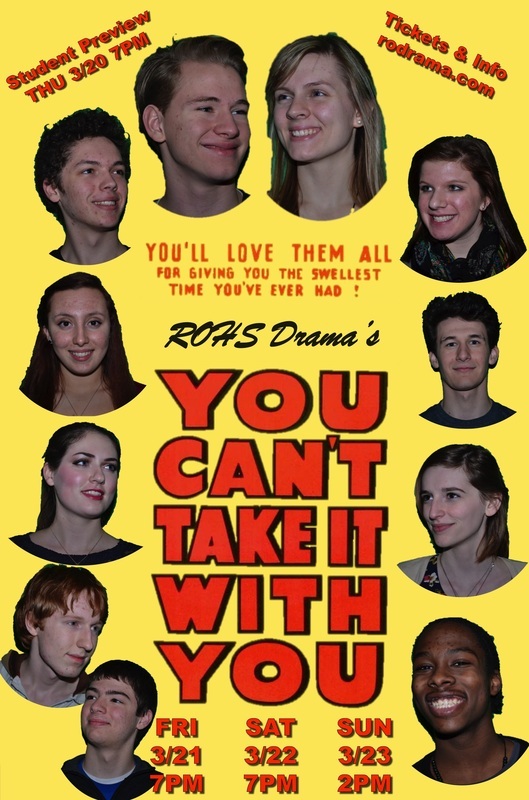 It's 48 Audition Photos per page, 14 page per row, 12 rows of pages, 168 pages of photos each shaded just so ... making a REALLY BIG SIGN of 8064 photos for Royal Oak High School's production of "You Can't Take It With You" March 21, 22 and 23!! 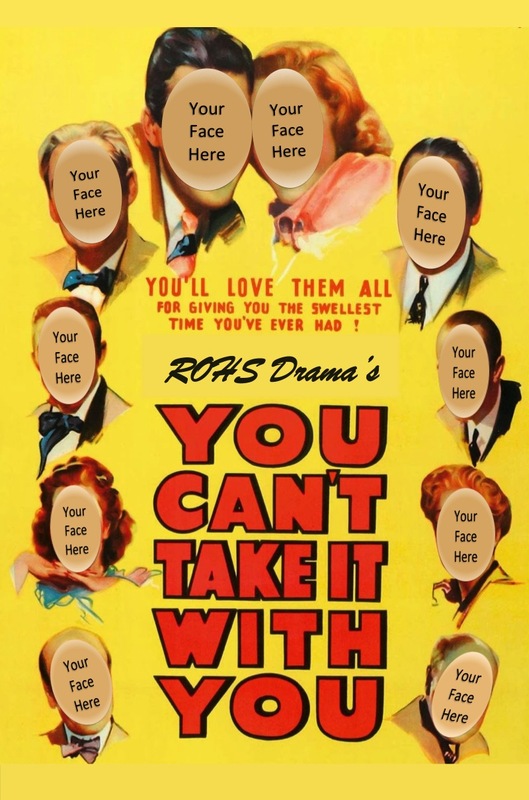 Post by ROHS Drama Club. Download the entire program and read it any time you want to!! You Can't Take It With You in the Daily Tribune!! Check out the article here OR pick up an actual newspaper on Thursday to keep forever! Thanks to Joe Ballor for the great article. 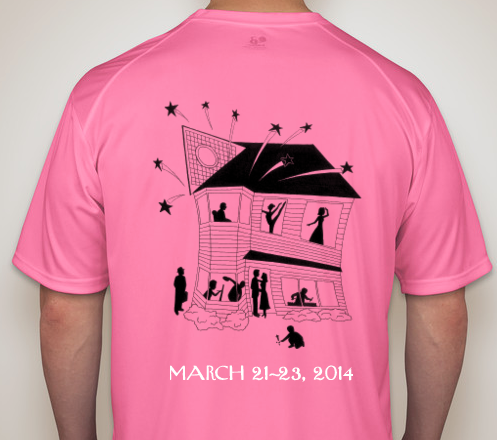 Click the order form below to download. 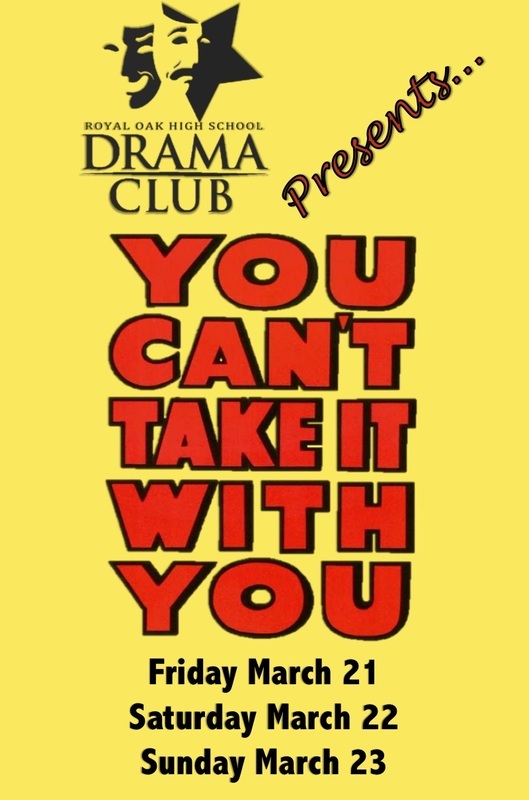 Bring it with payment to any Drama Club rehearsal before Saturday March 8th or order through Pay Pal with your credit card by click thing the button to the right!! At first the Sycamores seem mad, but it is not long before you realize that if they are mad, then the rest of the world is madder. In contrast to these delightful people are the unhappy Kirbys. Tony, the attractive young son of the Kirbys, falls in love with Alice Sycamore and brings his parents to dine at the Sycamore house on the wrong evening. The shock sustained by Mr. and Mrs. Kirby, who are invited to eat cheap food, shows Alice that marriage with Tony is out of the question. The Sycamores find it hard to understand Alice's view. Tony knows the Sycamores live the right way with love and care for each other, while his own family is the one that's crazy. In the end, Mr. Kirby is converted to the happy madness of the Sycamores after he happens in during a visit by the ex-Grand Duchess of Russia, Olga Katrina, who is currently earning her living as a waitress. Usually goes by Penny, Penelope is the mother of the Sycamore family. She writes plays and paints as hobbies because it makes her happy, but is terrible at both. Penny is a loving mother and wife to Paul and is constantly concerned with the welfare of her family. Her main goal is to make sure everyone is happy, particularly her daughter Alice. He is an eccentric happy old man who has never paid his income tax because he doesn't believe in it. He lives his life by the philosophy: “Don't do anything that you're not going to enjoy doing.” He goes to circuses, commencements, throws darts, and collects stamps. She is the only "normal" family member. She has an office job, and is rather embarrassed by the eccentricities of her family when she has Tony and his parents at her house, yet she still loves him. She tends to be a pessimist. He sees how, even though the Sycamores appear odd, they are really the perfect family because they love and care about each other. His own family is very proper and has many issues none of them will admit. He is vice president of Kirby and Co. He is a very proper man who is president of Kirby and Co. and secretly despises his job. His hobby is raising expensive orchids. He is also a member of the Harvard Society, the Union Club, the National Geographic Society, and the Racquet Club. She is childish. As a hobby she makes candy that Ed sells. Essie dreams of being a ballerina. She has spent 8 years studying with Boris Kolenkhov, but is a terrible dancer. A Russian who escaped to America shortly before the Russian Revolution. He is very concerned with world politics, and the deterioration of Russia. He is the ballet instructor of Essie, aware that she is untalented at dancing, but knows that she enjoys dancing so he keeps working with her. He is opinionated and often loudly declares that something "stinks"! He is a Tinker who manufactures fireworks in the basement with the help of his assistant Mr. De Pinna. His hobby is playing with erector sets. It will help have an age appropriate actor for this role. A common, fatherly character is all Paul needs. He is a xylophone player, and distributes Essie's candies. Ed is an amateur printer who prints anything that sounds good to him. He prints up dinner menus for his family and little quotes that he places in the boxes of Essie's candy. He also likes to make masks. The iceman who came inside to speak to Paul five years before, and never left. He helps Mr. Sycamore build fireworks, and moonlights as a model in Mrs. Sycamore's paintings. He is a nutty guy. The maid and cook to the Sycamore family. She is dating Donald. An employee of the IRS. He comes to collect the tax money owed by Grandpa, and can't understand why the latter won't pay income tax.